Ryan has produced a diversity of vegetables since 2003 on his 80-acre farm where he formerly leased a portion to tobacco. 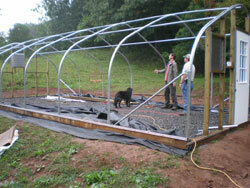 He is one of the few certified organic farms in Yancey County. With his award, he will build a Solar Star greenhouse to hold 40,000 brassica plants at any time. He expects a savings for not purchasing transplants, and an increase in income from sales of organic plants. Ryan markets his vegetables directly to wholesale distributors and grocery stores, as well as to individuals at the Yancey County Farmers Market.